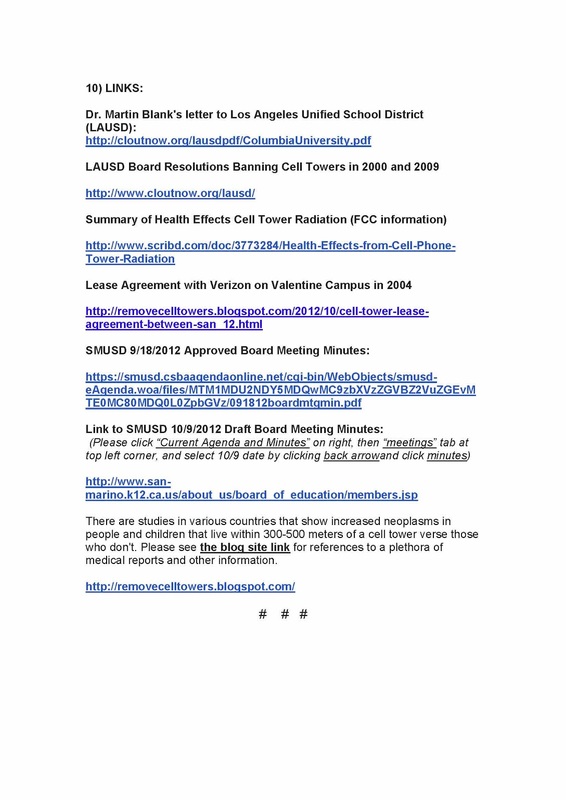 Thank you to everyone who has already signed the petition to remove the cell towers from San Marino campuses. It takes a group effort to make a difference. There are several updates and important information we would like to share. Please click on the items below that are the facts as correctly and honestly as we can validate and document. Thank you for your time and support! 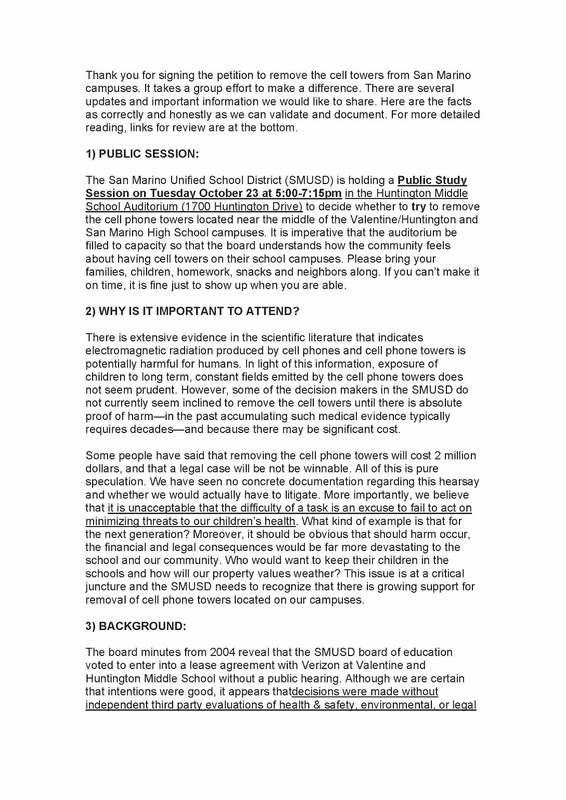 The San Marino Unified School District (SMUSD) is holding a Public Study Session on Tuesday October 23 at 5:00-7:15pm at the Huntington Middle School Auditorium (1700 Huntington Drive) to decide whether to try to remove the cell phone towers located near the middle of the Valentine/Huntington and San Marino High School campuses. It is imperative that the auditorium be filled to capacity so that the board understands how the community feels about having cell towers on their school campuses. Please bring your families, children, homework, snacks and neighbors along. If you can’t make it on time, it is fine just to show up when you are able. 2) WHY IS IT IMPORTANT TO ATTEND? There is extensive evidence in the scientific literature that indicates electromagnetic radiation produced by cell phones and cell phone towers is potentially harmful for humans. In light of this information, exposure of children to long term, constant fields emitted by the cell phone towers does not seem prudent. 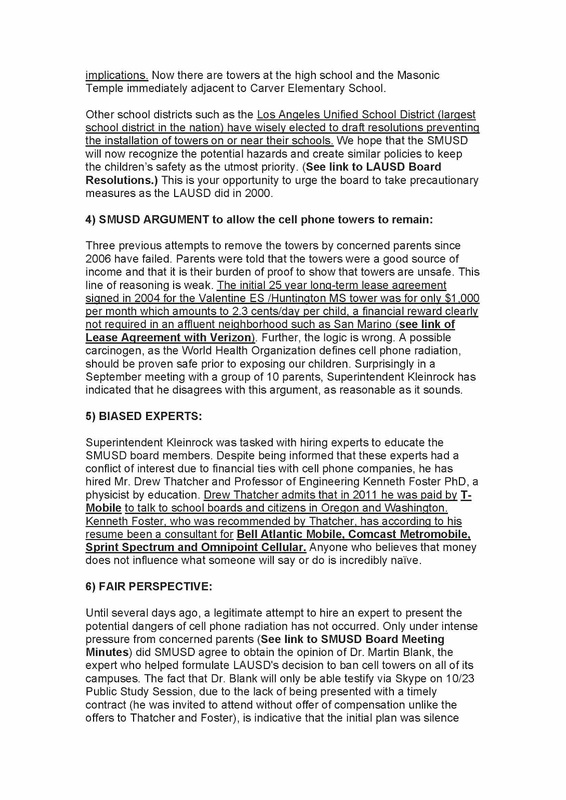 However, some of the decision makers in the SMUSD do not currently seem inclined to remove the cell towers until there is absolute proof of harm—in the past accumulating such medical evidence typically requires decades—and because there may be significant cost. Some people have said that removing the cell phone towers will cost 2 million dollars, and that a legal case will be not be winnable. All of this is pure speculation. We have seen no concrete documentation regarding this hearsay and whether we would actually have to litigate. More importantly, we believe that it is unacceptable that the difficulty of a task is an excuse to fail to act on minimizing threats to our children’s health. What kind of example is that for the next generation? Moreover, it should be obvious that should harm occur, the financial and legal consequences would be far more devastating to the school and our community. Who would want to keep their children in the schools and how will our property values weather? 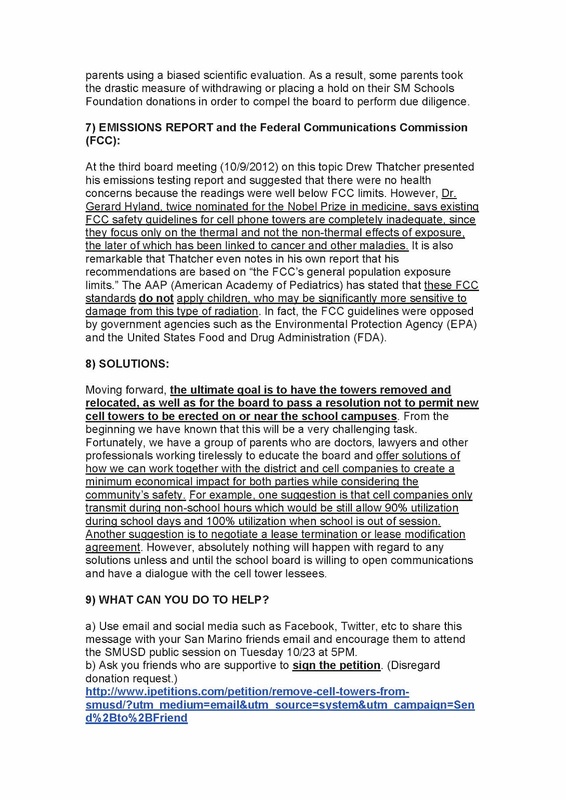 This issue is at a critical juncture and the SMUSD needs to recognize that there is growing support for removal of cell phone towers located on our campuses. 3) WHAT CAN YOU DO TO HELP? a) Use email and social media such as Facebook, Twitter, etc to share this message with your San Marino friends email and encourage them to attend the SMUSD public session on Tuesday 10/23 at 5PM. Please click on the items below for the Background, SMUSD Argument, Biased Experts, Fair Perspective, Emissions Report, Solutions, and Useful Links. Thank you!